i’ve been wanting to try out a pork tenderloin recipe for so long, especially after eating the berkshire pork tenderloin at fearing’s so many times (picture below). 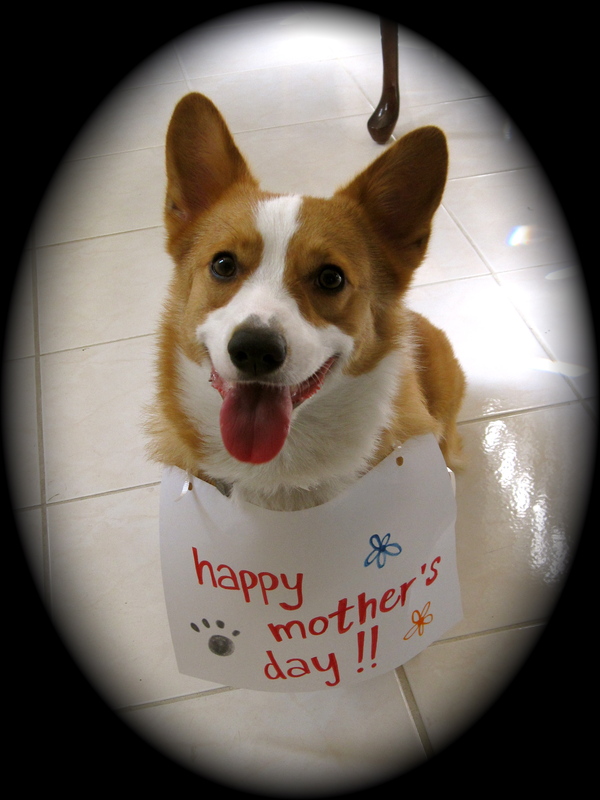 mother’s day was the perfect special occasion to try it out. using dean’s dish as an inspiration, i created something similar on my own. 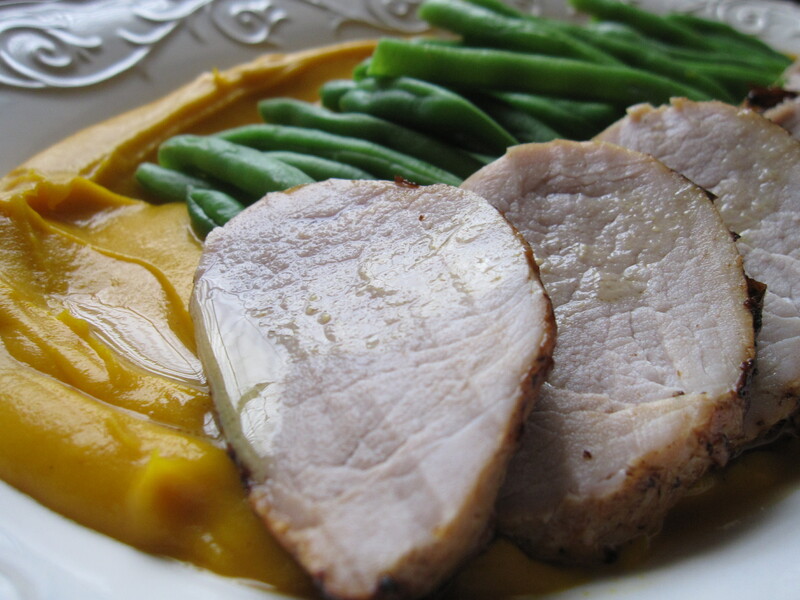 i’ll call it a pork tenderloin in maple apple brine, served with honey mustard sauce and a squash puree. 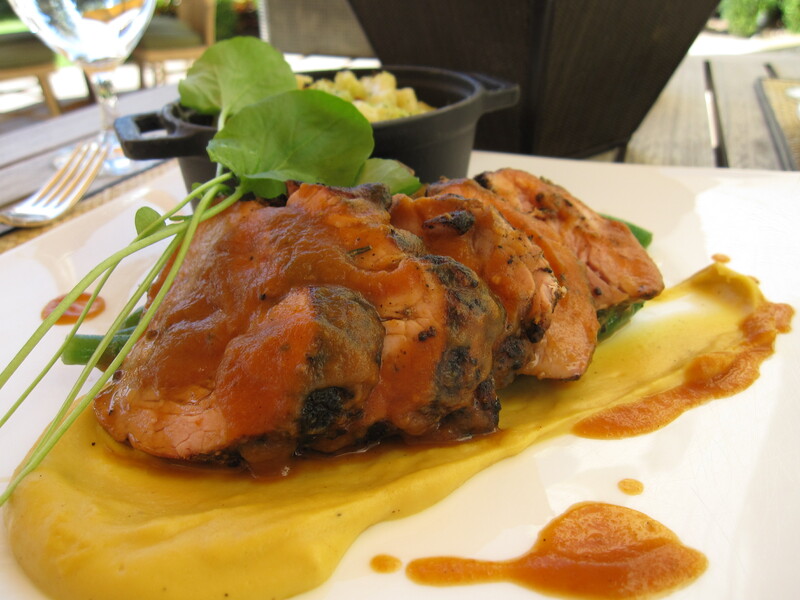 brining it similar to marinating…why it’s not called marinating, i don’t know? but i think brining is more focused on the salt aspect flavoring the meat vs. herbs or other sauces. 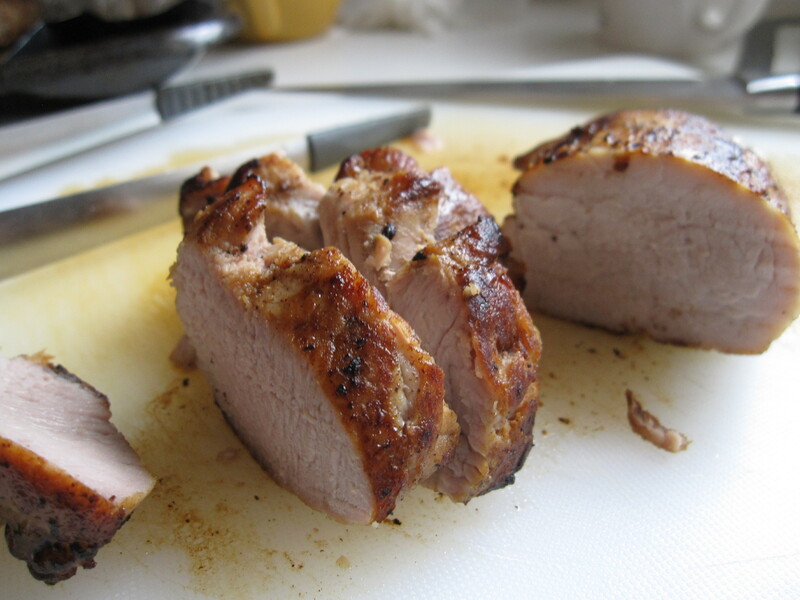 i’ve brined meat three times in my life – two turkeys and now a pork tenderloin. and each time i’ve brined something, it’s turned out so tender and moist. this time was no different. brine: stir 3 1/2 cups of hot water with 1/4 cup of sea salt until salt is dissolved. then add 1 cup of apple juice, 1/4 cup of maple syrup, 2 tablespoons of brown sugar, and 1 tablespoon of cracked pepper to the mixture. 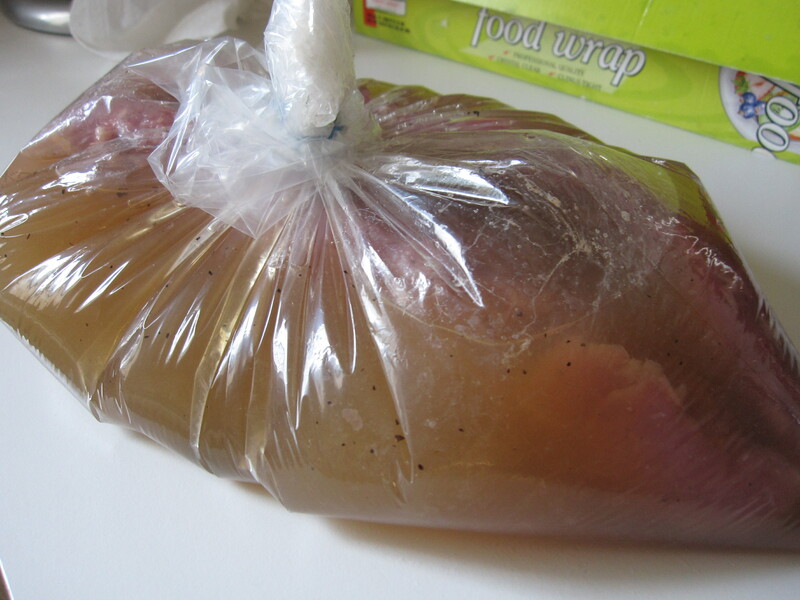 after the brine is cooled, place your pork tenderloin in a large zip lock bag (i had two tenderloins, so i used a large oven bag) and pour the brine in. make sure all the meat is covered by the brine. refrigerate for 6-8 hours. acorn squash puree (prepare at least two hours prior to serving): cut the squash in half (you’ll need a good knife), scoop out the seeds, place 1 tbsp of butter in each half. wrap with foil and bake at 375 degrees for one hour. after the squash has cooled (enough to where you aren’t burning your hands), scoop out filling into a blender, add 1 cup of hot water, and 1 tbsp of nutmeg and blend together. add more water to achieve puree-like (baby food-like) consistency. 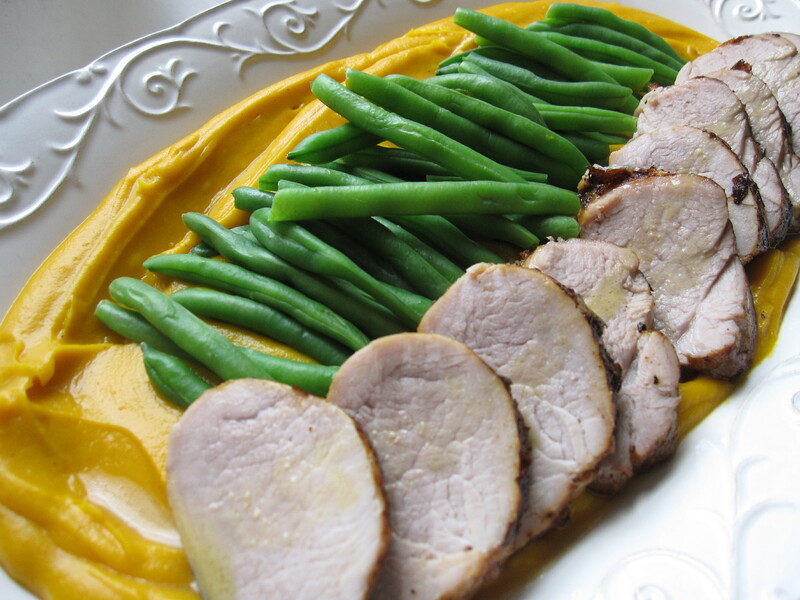 honey mustard sauce: given how flavourful the pork turned out, there’s really no need for this sauce. but it’s basically 2 tablespoons of dijon mustard, 1 1/2 tablespoon of honey, 2 tablespoons of apple juice whisked together. after 7 hours of brining…. remove pork tenderloin from brine and pat dry. season all sides with cracked pepper. cook tenderloin on medium-high heat so that each side browns (approximately 5-6 minutes total). place tenderloin on baking sheet and bake at 425 degrees for 12-15 minutes. you’ll be tempted to eat the pork right away, but let the pork stand for at least 5 minutes (i waited 10) before slicing, so that all the juices redistribute. verdict? DELICIOUS. nice crispy skin, tender meat inside with hint of maple flavor – good blend of salty and sweet.